This book was first published over 10 years ago, and has been released once again as a revised edition. 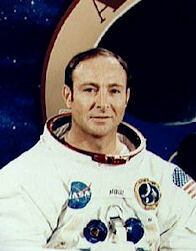 The main author is the Apollo astronaut, Dr Edgar Mitchell. He is a very well-educated individual, whose experiences in space opened his eyes to alternative possibilities beyond science. 'The Way of the Explorer' sets out to amalgamate his orthodox, scientific learning with inner, mystical vision. The book begins as an autobiography, tracing Dr Edgar Mitchell's ascendance firstly through the ranks of cutting-edge military test pilots, and ultimately into space to the Moon. He portrays himself as a single-minded man whose goal required his entire focus, sometimes to the detriment of his family. His successful flight to the Moon must have been an incredible experience on a human level, and Dr Mitchell sketches out some of his feelings amid a fairly technical account of the flight itself. Unusually, his interest in the paranormal led him to conduct experiments in space. These experiments were then made public in a rather sensationalist fashion upon his arrival back on Earth. On the way back towards Earth, Dr Mitchell experienced the Samadhi state. This event, rather than the Moon landing itself, seems to have been the seed which fashioned the rest of his life's focus. He is an intense individual, and he threw himself into a second exploration, this time of the inner self. The remainder of the book deals with this topic. He offers an excellent analysis of the central importance of mysticism to various religions, and views the topic from the academic viewpoint of a neutral agnostic, possibly even an atheist. Some of the book is quite like 'The Tao of Physics'. Dr Mitchell takes the quirky aspects of quantum physics and finds parallels with Eastern Mysticism. His writing is drier than many popular science authors, and is aimed at a reader of reasonably high intellectual attainment. The central section of the book is no walk in the woods, that's for sure. But, like a climb to the top of a mountain, the book suddenly reveals a remarkable vista on arriving at Chapter 26. Dr Mitchell's central proposal is that learning and knowledge transcend individual consciousness. Instead, they are embedded within the fabric of the Universe itself, and available to consciousness through the properties of the wave/particle duality described by quantum mechanics. Essentially, if I understand his thesis correctly, information is held in two separate states; material, and in the form of a quantum hologram. Rather like a shadowy ghost, this second form of information is separated from the material host and recombined into the matrix of the universe, finding its home in the zero-point field. It can then be accessed at a later date (and Dr Mitchell iterates that time is a one-way process) by a being of high spiritual attainment. Thus, we can learn non-locally, by tuning into spiritual frequencies within ourselves. This explains the many accounts of past-life regression, for instance, and other paranormal events where non-local information is received by a psychic. This theory is known as the 'dyadic' model, and is the main focus for the work of Dr Mitchell's Institute of Noetic Sciences. In a way, the universe is learning about itself through the self-reflective consciousness of human beings. Dr Mitchell seems to reject the idea of a paternalistic God, and sees spiritual experience in terms of a energetic mechanism embedded into the fabric of the Universe. How to prove it? Through the study of the paranormal, preferably under scientifically valid conditions, argues Dr Mitchell. He has much experience of this himself, through his own experiments in space, and through the association with and study of psychics like Uri Geller. There is a great deal of wisdom in this book. It reminds me more of a Buddhist Wisdom book than a popular science book. Like Buddhist teachings, it is difficult to follow, and is fundamentally deep. But, ultimately, the book is rewarding. Towards the end, particularly in the revised section, the book rambles and repeats itself whilst trying to focus on the issues of the day. It doesn't seem so necessary to me to try to find a sense of urgency for this material. It stands on its own two feet, one particle, one quantum hologram. For me, personally, it serves to point a way for an agnostic like me to seek inner wisdom in the Universe, and to see the bigger picture in the absence of a tangible presence of God. So, thanks, Dr Mitchell, for a wonderfully enlightened book. I include a few quotes from the book below, which will serve to give the reader a feel for the astronaut's writing style. 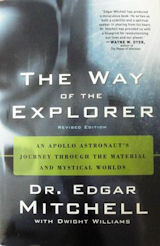 Subtitled: "An Apollo Astronaut's Journey Through the Material and Mystical Worlds"